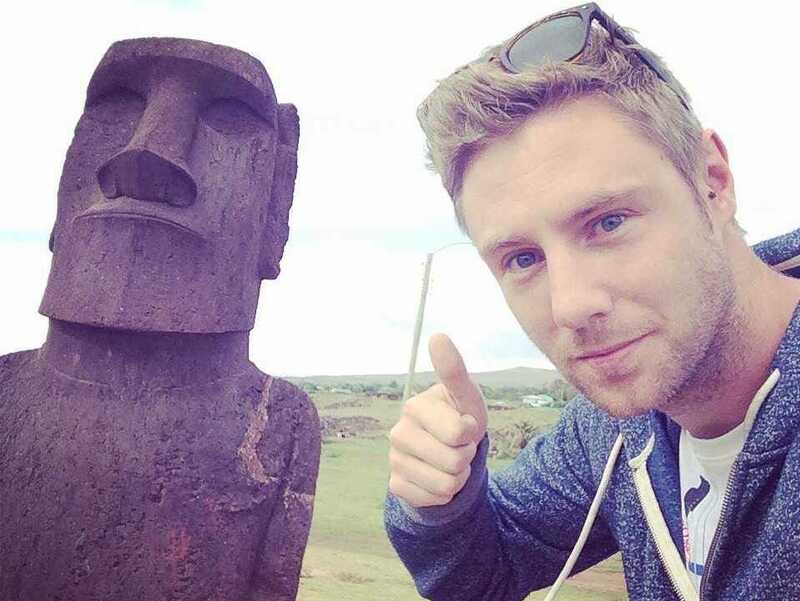 (Johnny Ward / OneStep4Ward) Johnny Ward at Easter Island in 2014. In 2009, Johnny Ward was living in Australia, working for a company that organized corporate conferences. It was a sales job, and with his commission he was able to earn up to $20,000 a month. Ward, who was raised by a single mother in Northern Ireland, couldn't believe how much he was earning after years of hustling for cash. "I come from quite a poor family," he says. "It was crazy. Not having had much growing up, I'm careful with money. I have anxiety about not being broke again." Between graduating from university in England in 2006 and taking on his steady office job, Ward had worked as a counselor at summer camps in the US and taught English in Thailand — for which he spent five weeks participating in medical research in an Irish hospital to raise the money for his trip, which he remembers was between $2,000 and $3,000. The secure job in Australia, while high-paying, was still missing something, he thought. "I felt like it wasn't fulfilling in any way," the now 31-year-old says, "and I wasn't free, having to ask for permission for take time off — and I don't do well with authority." He only lasted six months in his sales job, and when he tried to leave, his employers offered to put him in a new position, double his salary, and sponsor him for an Australian passport. Ward accepted, but his heart wasn't in it. He lasted only another four months in the new role. In 2010, he left for Africa. "The World Cup was on, and I had all this money burning a hole in my pocket," he says. "I'd never seen money like that in my bank account before, so I booked a one-way ticket to Zimbabwe." (Johnny Ward / OneStep4Ward) Ward in Baños, Ecuador. Before arriving in Zimbabwe, Ward had spent the last few months setting up a website — a travel blog, to document the exploring he now had the money to do. "I'm terrible at tech," he admits. "If I forget my Facebook password, it's a struggle. I associated the concept of making money online with this like charlatan personality. I couldn't get my head around how people actually do it, and then I cracked the specific thing that I do online and was like 'Wow, I can't believe it.'" "I remember the first bucks I ever made," he says. "It was like $80. The first guy ever to pay me for an advertisement on my site changed my mindset entirely, and I thought, 'This might work!'" As he embarked on a mission to see every country in the world, he used the insights he'd gained from his blog, OneStep4Ward, to create an online media company: Step4Ward Media, which provides web services like creating content and managing SEO. Ward works virtually with four other people, and in the three years since he established the company, Step4Ward Media has earned $1 million and averages about $1,000 a day. 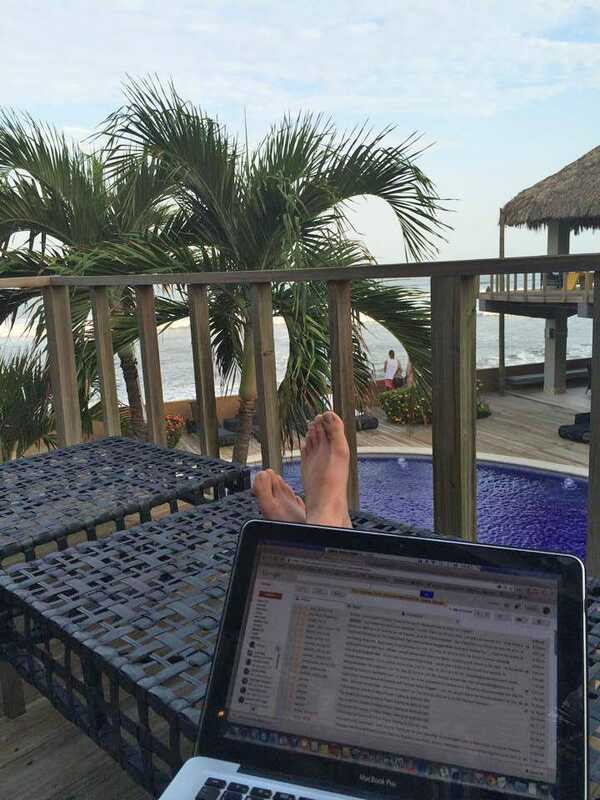 (Johnny Ward / OneStep4Ward) A day at the office for Ward in Tamanique, El Salvador. One of the first things he did with the money was buy a two-bedroom apartment in Thailand, in cash, where he now spends about three months out of every year working and relaxing before heading off again. Currently, he's visited over 140 countries. "It doesn't seem that real," he reflects. "I don't live a flash lifestyle, so it feels arbitrary. I'm really careful with my money. I have a wealth manager in the UK, and I'm investing heavily. I bought a place in London and the one in Bangkok, and I'm looking to buy another in London." He advises people who want to live a similar lifestyle to take the plunge. "I worry in the social media age, people get so caught up in creating inspirational memes and oversharing, when you just gotta do it," he says. "I love to read that stuff, but you need to draw a line in the sand and say, 'Now I'm going to do it.' You can get caught up in the online hyperbole. I tell people you don't need to make $1 million. Initially you can make $1 or $10 or $50, and have that money in your Paypal and then be like, 'Wow, this is actually possible.'" Also, he says, start a blog. "No matter how you plan to make money online, always start a blog, even if you're not going to monetize. Have a voice, be an authority. I think having a blog is so integral to that movement." "I always dreamed of being free," he says. "Initially that feeling came from backpacking broke, but I wasn't truly free because I wasn't financially free. Truly free is to have the financial security to allow you to do whatever you want to do." Have you taken a nontraditional career path to start earning more on your own? Or have you given up a steady income to simplify your life and live on less? Reach out to yourmoney[at]businessinsider[dot]com.